The 2017 Honda Ridgeline is in stock at Brilliance Honda of Crystal Lake, and the RTL-E is one of the top trim levels, with only the exclusive Black Edition above it. The RTL-E gets many sophisticated features and premium amenities to keep you and your passengers safe, happy, and comfortable. Find out more about the RTL-E here at Brilliance Honda of Crystal Lake, just a short drive from Elgin, IL! The RTL-E also includes other highlights such as the Honda Satellite Linked Navigation system, a 7-inch touchscreen infotainment system Apple CarPlay and Android Auto, power adjustable heated leather seats, 18-inch alloy wheels, automatic climate control, and more. The RTL-E is equipped with a 3.5L V6 engine that generates 280 hp and 262 lb-ft of torque. The EPA estimates that the AWD RTL-E will achieve 18 mpg city/25 mpg highway/21 mpg combined when paired with a standard six-speed automatic transmission*. When properly equipped with a towing package and standard all-wheel drive, this truck reaches a maximum payload capacity of up to 1,499 pounds and a maximum towing capacity of up to 5,000 pounds. The Ridgeline RTL-E also gets features like a multi-angle rearview camera, traction and stability control, and anti-lock brakes. 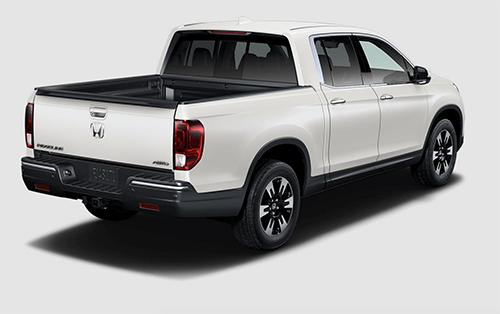 The latest Honda Ridgeline is in stock now here at Brilliance Honda of Crystal Lake, located at 680 W. Terra Cotta Rd. in Crystal Lake, IL. We’ve got a range of current Honda models in stock, and we’re just a few minutes from Elgin. Visit us to find the one that fits your needs best today!